A TinkerTry reader send this great comment early today, how timely! I'm disappointed that I don't have a great answer for Koen, at least not yet anyway. 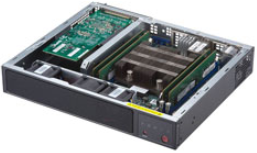 Click to visit the Supermicro SuperServer E300-9D Product page. For folks who don't need much storage and don't mind 1U fan noise, the only system based on the Xeon D-2100 that seems somewhat suited for home labs is the affordable 4 core Supermicro SuperServer SYS-E300-9D that can go all the way to 512GB memory (DDR4/2666MHz) some day, discussed below. This article shows the research I did along the way, with a careful look at each aspect of the announcements. I'm also excited to announce I have some hands-on testing planned, but I haven't yet heard when my system will arrive. The Intel Xeon D-2100 isn't so much as a successor to the successful Broadwell-based Xeon D-1500 line, but more of a complementary, higher-end offering, expanding the range of options available to OEMs, featuring greatly increased expansion possibilities. Both product lines continue onward in parallel, and both are based on Intel® 14 nm Technology. The first Xeon D was the Xeon D-1540, an 8 core offering announced March 2015, and first shipping in volume by Supermicro in July, but I got my hands on mine on June 25, 2015, which may have been one of the very first ever produced. This big launch included the popular Xeon D-1541, which finally offered full SR-IOV too, marking the start of a big uptick in Xeon sales, and validating that the platform was here to stay. Supermicro led the Xeon D market with a variety of systems, that all wildly exceeded anything the Intel NUC could offer, including full VMware vSphere 6.0, and/or 6.5 support from a huge variety of shapes and sizes from various known and unknown OEMs. I've added some product hyperlinks and pictures of the systems and motherboards being announced in the press releases below, but the text itself is unchanged. Note that both press releases below link to the Embedded Solutions Brochure, but that older PDF is still from October 2017. 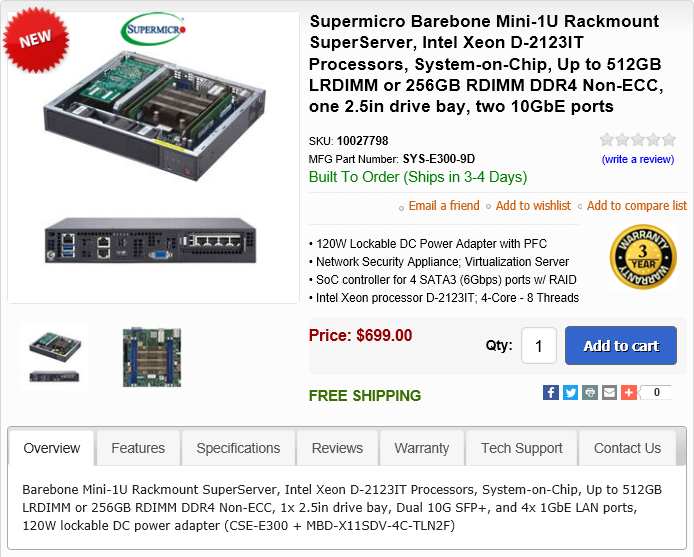 The product pages for the SuperServers themselves are only starting to surface, with several just saying "Coming Soon" on the Supermicro Xeon D-2100 X11 UP (Uni-processor) page, with a Mar 10 2018 screenshot of that page seen at right, click twice to really zoom in. Now let's roll-up our sleeves and dive into the two recent press releases by Supermicro that feature Xeon D-2100. Highlighted are the parts that are of most relevance to the admittedly niche home lab / virtualization enthusiast market that seeks out lots of memory and CPU cores, along with high speed networking soldered right into reasonably efficient and quiet form factors that these SoC designs offer. Stick with me here, you'll also find a detailed summary of my feelings about these these announcements below. SAN JOSE, Calif., February 7, 2018 — Super Micro Computer, Inc. (NASDAQ: SMCI), a global leader in enterprise computing, storage, networking solutions and green computing technology, today announced several new additions to its edge computing and network appliance portfolio based on the new Intel® Xeon® D-2100 SoC (System-on-a-Chip) processor. Leveraging its deep expertise in server technology, Supermicro is bringing customers some of the first Intel® Xeon® D-2100 System-on-a-Chip (SoC) processor-based solutions. The company’s X11SDV series motherboards offer infrastructure optimization by combining the performance and advanced intelligence of Intel® Xeon® processors into a dense, lower-power system-on-a-chip. Supermicro is introducing a wide range of new systems to the market including compact embedded systems, rackmount embedded systems, as well as multi-node MicroCloud and SuperBlade systems. With server-class reliability, availability and serviceability (RAS) features now available in an ultra-dense, low-power device, Supermicro X11SDV platforms deliver balanced compute and storage for intelligent edge computing and network appliances. These advanced technology building blocks offer the best workload optimized solutions and long life availability with the Intel® Xeon® D-2100 processor family, available with up to 18 processor cores, up to 512GB DDR4 four-channel memory operating at 2666MHz, up to four 10GbE LAN ports with RDMA support, and available with integrated Intel® QuickAssist Technology (Intel® QAT) crypto/encrypt/decrypt acceleration engine and internal storage expansion options including mini-PCIe, M.2 and NVMe support. Supermicro’s new SYS-E300-9D is a compact box embedded system that is well-suited for the following applications: network security appliance, SD-WAN, vCPE controller box, and NFV edge computing server. 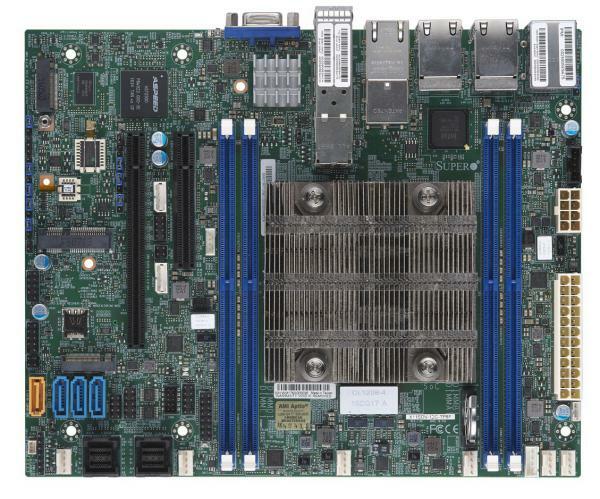 Based on Supermicro’s X11SDV-4C-TLN2F mini-ITX motherboard with four-core, 60-watt Intel Xeon D-2123IT SoC this system supports up to 512GB memory, dual 10GbE RJ45 ports, quad USB ports, and one SATA/SAS hard drive, SSD or NVMe SSD. The new SYS-5019D-FN8TP is a compact (less than 10-inch depth) 1U rackmount embedded system that is ideal for cloud and virtualization, network appliance and embedded applications. 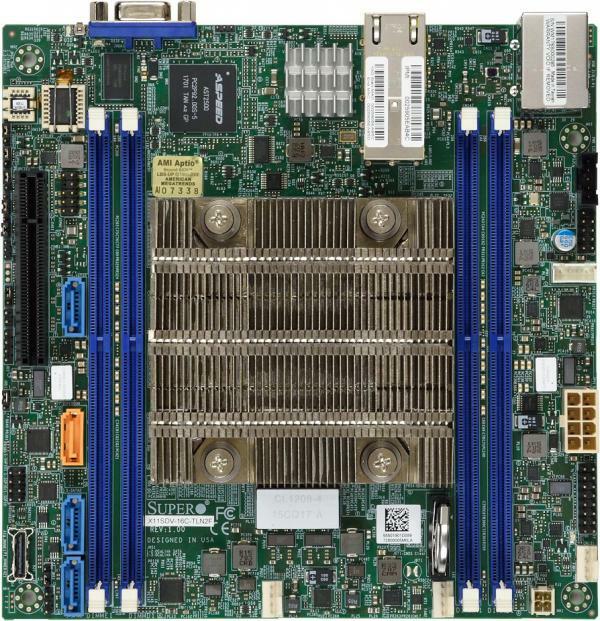 Featuring Supermicro’s X11SDV-8C-TP8F flex-ATX motherboard supporting the eight-core, 80-watt Intel Xeon D-2146NT SoC, this power and space efficient system with built-in Intel QAT crypto and compression supports up to 512GB memory, four GbE RJ45 ports, dual 10GbE SFP+ and dual 10GbE RJ45 ports, dual USB 3.0 ports, four 2.5” internal SATA/SAS hard drives or SSDs, and internal storage expansion options including mini-PCIe, M.2 and NVMe support. Supermicro is introducing two new MicroCloud servers based on the new processors. Perfect for cloud computing, dynamic web serving, dedicated hosting, content delivery network, memory caching, and corporate applications, these systems support eight hot-pluggable server nodes in a 3U enclosure with a centralized IPMI server management port. The SYS-5039MD8-H8TNR features the 8-core, 65-watt Intel Xeon D-2141i SoC, and the new SYS-5039MD18-H8TNR features the 18-core, 86-watt Intel Xeon D-2191 SoC. 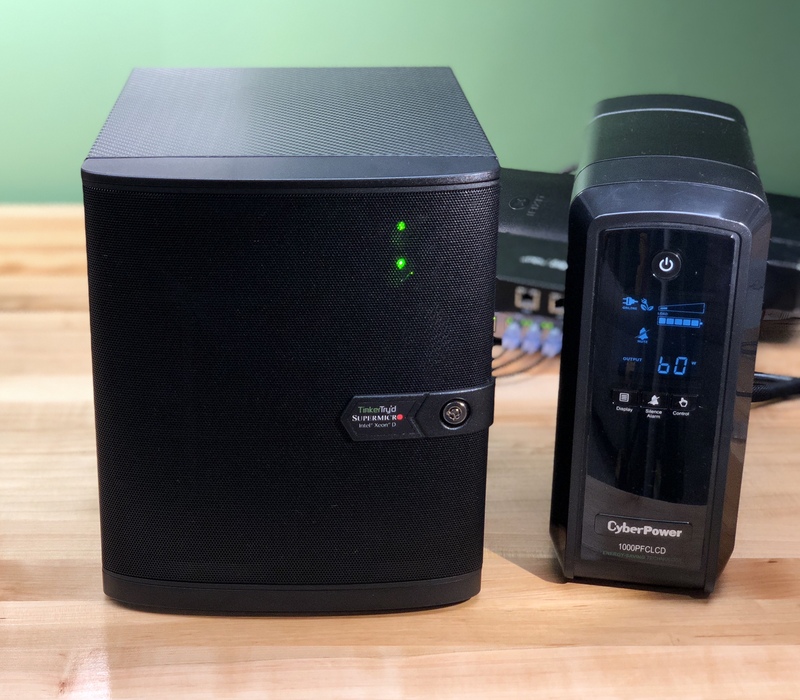 Each server node for these MicroCloud systems supports up to 512GB of ECC memory, one PCI-E 3.0 x16 expansion slot, two hybrid storage drives that support U.2 NVMe/SATA3, two M.2 NVMe/SATA3 connectors, and dual GbE ports. Supermicro’s 4U/8U SuperBlade enclosures feature blade servers that support new Intel Xeon D-2100 System-on-a-Chip (SoC) processors, including the 18-core D-2191 processor as well as the 16-core D2187NT processor with 100G Crypto/Compression. The blade servers support up to 512GB DDR4 memory, hot-plug 2.5” U.2 NVMe/SATA drives, M.2 NVMe, and 25Gb\10Gb Ethernet and 100G Intel® Omni-Path (OPA) or 100G EDR InfiniBand. Redundant chassis management Modules (CMM) with industry standard IPMI management tools, high-performance switches, integrated power supplies and cooling fans, Battery Backup Modules (BBP) make this all-in-one blade solution ideal for datacenter and cloud applications. NUREMBERG, Germany, Feb. 27, 2018 — Super Micro Computer, Inc. (NASDAQ: SMCI), a global leader in enterprise computing, storage, networking solutions and green computing technology, today announced that it is highlighting new additions to its extensive edge computing and gateway product portfolio, including solutions based on the new Intel® Xeon® D-2100 SoC (System-on-a-Chip) and Intel® Atom® C3000 SoC processor at Embedded World 2018 from February 27-March 1, Nuremberg Exhibition Centre booth 1-330. 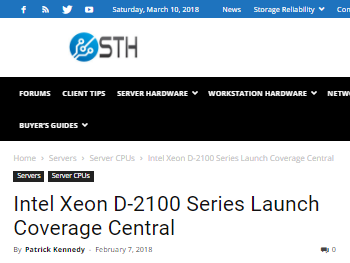 Leveraging its deep expertise in server technology, Supermicro is introducing a full line of solutions that support the latest Intel® Xeon® D-2100 SoC processors (codenamed Skylake-D) with up to 1.6x compute performance improvement compared to the last generation. The X11SDV series motherboards offer infrastructure optimization by combining the performance and advanced intelligence of the new system-on-a-chip processors into a dense, lower-power compact solution ideal for embedded applications. With server-class reliability, availability and serviceability (RAS) features now available in an ultra-dense, low-power device, Supermicro’s X11SDV platforms deliver balanced compute, storage and networking for the intelligent Edge. These advanced technology building blocks offer the best workload optimized solutions and long life availability with up to 18 processor cores, up to 512GB DDR4 four-channel memory operating at 2666MHz, up to four 10GbE LAN ports with RDMA support, and available with integrated Intel® QAT (Quick Assist Technology) crypto/encrypt/decrypt acceleration engine and internal storage expansion options including mini-PCIe, M.2 and NVMe support. For more details on Supermicro’s solutions that support high-performance Intel® Xeon® D SoC processors, please visit www.supermicro.com/products/nfo/Xeon-D.cfm. In addition to these new solutions in compact box and 1U rack systems, Supermicro is also showcasing the latest low-power Intel® Atom® embedded solutions in fan-less compact box, short-depth 1U rack and mini-tower systems. 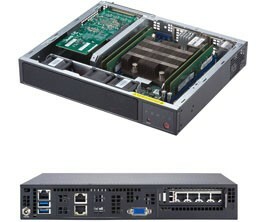 For more information on these diverse low-power products, please go to: www.supermicro.com/products/nfo/Atom.cfm. Supermicro is demonstrating fan-less modular solutions using passive cooling techniques that can operate in extreme temperature and provide protection from dust ingress and condensation with IP51 (Ingress Protection) certification, too. The industrial grade compact enclosure designs provide modular expansion housing ultra-small form factor 3.5” SBC or 2.5” Pico-ITX designs with integrated DC power support, storage expansion and wireless networking capabilities. With Xeon D-2100 supporting 512GB of memory, and maybe even 1TB of memory someday, you'll likely be needing to think about memory interleaving again, something you didn't need to think about on the Xeon D-1500, where you could buy 2 32GB DIMMs with your Bundle, and enjoy full speeds whether or not you used those remaining 2 slots with 2 more 32GB DIMMs later on, with no wasteful removal of the DDR4 you already invested in. This is no small thing, as DDR4 prices have risen from around $175 when I first gone mine in 2016, all the way to $375 now in 2018. Today signals the general availability of the processor in the market, and we are working with industry leaders including Dell EMC, Ericsson, F5, NEC, NetApp, Palo Alto Net and Supermicro on to deliver solutions to our joint end-customers. 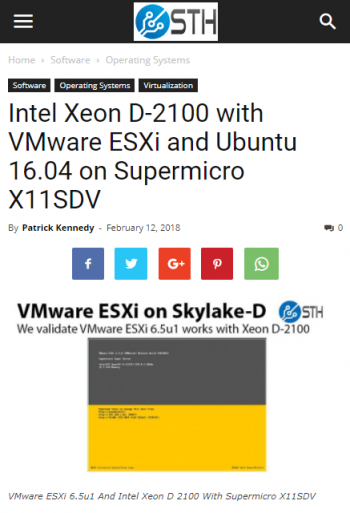 where you'll notice Supermicro as one of the launch partners, but no mention of the Gigabyte, ASRock, and Tyan offerings that are clearly listed on Patrick's excellent Xeon D-2100 Launch Central. Oops? Perhaps they're just delayed, but at least a nod to their planned efforts would seem to have been a nice gesture. Also note that Dell EMC is listed, but I'm finding nothing out there, not yet anyway. Mini Towers - Nothing with Intel Xeon D-2100 inside, darn! Here's Supermicro's Mid-Tower / Mini-Tower Solutions that only show the current Xeon D-1541 based Supermicro SuperServer SYS-5028D-TN4T system. There is no good technical reason I can think of for this, given the 65 watt TDP of many Intel Xeon D-2100 CPUs fit the same thermal envelope that the SuperChassis CSE-721TQ-250B obviously handles just fine in the Bundle 2 12 core, pictured below. Also note that there is no SYS-E200-9D, which could have been a step-up from the popular SYS-E300-8D that's also Mini ITX, and was successfully used for the VMworld 2017 Hackathon, pictured at right. Pictured below, you'll see just how good the versatile mini-tower can look, with 8 or 12 cores, a much quieter (slower spinning/large) chassis fan, plenty of internal storage bays, and a PCIe slot that can accomodate up to 4 more M.2 NVMe drives. Can you tell I'm more than a bit disappointed that the Xeon D-2100 hasn't arrived in this form factor, or something like it? Ideally a quiet system with two full-height PCIe slots in a Flex ATX cube, with plenty of U.2, SATA, and M.2 NVMe storage bays. Now that would be something I'd be very interested in TinkerTry'ing, to see if it would be suitable for inclusion in a future Bundle. 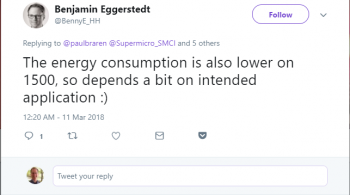 Supermicro, or not Supermicro. Supermicro SuperServer SYS-5028D-TN4T, resting on TinkerTry's new workbench, using only 60 watts at idle, even with several SSDs installed. My take on the Intel Xeon D-2100. 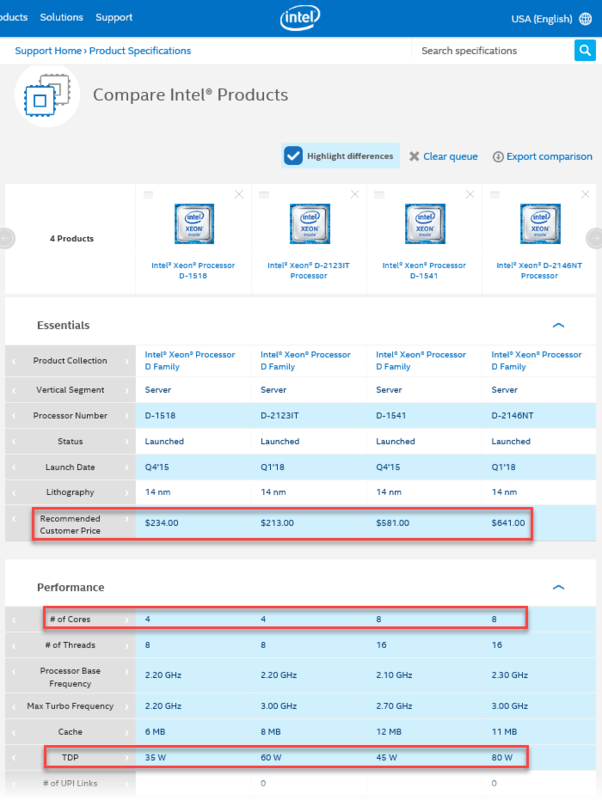 If you really need and can afford up to 512GB of RAM, or you need seamless vMotion from Xeon D-2100 to and from new systems that feature the Intel Scalable Processors (Skylake - Purley), or you need more than 12 cores, then by all means, yes, you should have a look at Xeon D-2100, available in 1U and 2U form factors. Of course, it is safer to wait for others to kick the tires first, ideally on the exact OS you're planning to run. For the rest of us, Xeon D-1500 is likely to continue onward as the best choice for quite some time, at least until 10 or 11 nanometer CPUs finally arrive, with Intel claiming a 3 year advantage. Before you ask, I'll add that currently AMD EPYC Embedded 3000 Series just doesn't seem of offer mainstream Windows and VMware vSphere support just yet, but that could change. My take on the Supermicro SuperServer SYS-E300-9D. If you need lot of memory in a compact form factor as the basis of something like a (test/unsupported) vSAN cluster, then this appears to be a good choice. This is conjecture, based purely on what's been published so far, with nobody reporting any hands-on time with this exact system just yet. A close second is the SYS-5019D-FN8TP that offers more storage bays and twice the CPU cores, for about $400 more, and using about 20 watts more. I have reached out to Supermicro and Wiredzone about seeing whether a mini-tower system based on Xeon D-2100 is something they're interested in, and of course I'll let you know if I make any progress. If that sounds good to you too, please let us know by dropping a comment below. I did get assurance that I'll be getting my hands-on a loaner Supermicro SYS-E300-9D SuperServer soon, but I don't have a date yet. You can be sure I'll be testing it like crazy, aka, TinkerTry'ing it, have a look at my previous close look at the first-in-world SYS-E200-8D and SYS-E300-8D examples here. Honestly, I currently don't even know when shipments from resellers like Wiredzone will even begin, but Wiredzone's listing currently shows "Build To Order (Ships in 3-4 Days)," so I suspect folks are receiving their pre-ordered systems soon. What's odd is that I don't even see a list of certified memory yet at the product pages at Supermicro and Wiredzone though, and there's no links to BIOS versions either. The systems are expected to ship with Spectre/Meltdown mitigation already applied though, a detail called-out by Intel in their Xeon D-2100 announcement. If you're not interested in waiting until this new chipset has been TinkerTry'd, it seems orders are being taken already, but the tested memory list doesn't appear to be ready just yet. Click link to visit product page TinkerTry affiliate link at Wiredzone, where the price is currently $699 as of March 10 2018, but this is subject to change at any time. Keep in mind bare-bones means you'll need to buy memory and storage. I have added RDMA (good), Optane Memory (no), M.2 (no), network (just two), and (unsupported) vSAN mentions to the good and bad lists above. This is when comments below articles and tweets are really fun for me, I love the feedback, as we share ideas and widely varying perspectives with one another. This is all armchair quarterbacking here, not until I get some actual GA level product (not engineering samples) will I be able to conclude much of anything with any real certainty. What you'll notice is that the 8 core Xeon D-2146NT seems to make a lot more sense if you're going to be spending over $3000 to get yourself a 128GB system, given today's RAM prices. In other words, would you really want just 4 cores at 60 Watts when $400 more gets you 8 cores, at a cost of 20 more Watts? This makes folks who are OK with the size and noise of 1U rack mount gear likely to lean toward the SYS-5019D-FN8TP, which isn't yet showing as available for pre-order at Wiredzone yet. So if you need small dense nodes at the most NUC-like prices (and performance), the SYS-E300-9D is appealing, especially given it's priced about the same as the SYS-E300-8D. We're not quite sure about the RAM yet though. If you need one beefier system and don't mind the size and noise of a 1U rack mount system, then the SYS-5019D-FN8TP may be the way to go, but keep in mind that it's SFP+ on the 10G ports, with no RJ45 model available on that system. See the list of all Xeon D-2100 (X11) systems and motherboards. Click the image above to view the Intel ARK table. The reason I say this is based on my experience with measuring watts at idle graph, where most home lab systems left running 24x7 spend the vast majority of their time, even my used-every-day (and for this article) SuperServer Workstation. Where I live, with electricity costs over 15 cents per kilowatt hour, so this sort of delta really matters to me. Add to that the fact that running VMware tends to keep the watt burn at idle a bit higher than when running other OSs. The reason I have only focused on the mini-tower Bundles I created is simple. Buyers of the mini 1U SYS-E300-8D and SYS-E200-8D complain about noise pretty often. Most SYS-5028D-TN4T mini-tower owners brag about how quiet their system is, enjoying less than a 0.5% return rate to Wiredzone. That's pretty amazing. Anybody that puts down $2K to $3K of their own money to invest in their home lab would likely want to get the most value they can, over the next several years of active use. Ideally with many expansion options, and a high family acceptance factor. These are just some of the reasons why I'm lamenting the fact that there is no mini-tower based on the Xeon D-2100 shipping by any OEM out there, not just Supermicro. That's a long-term opportunity, but in the short term, it's just disappointing. With SFP+ holding diminished appeal for me personally, and with the price uplift $700 for the 16 core model versus the 12 core model, here's a BOM of my own personal idea of the dream machine. Admittedly, it might not be at all supportable with full warranty, since it uses 3rd party components out of necessity. Most of my focus has been blogging about stuff that anybody can buy, anywhere in the world. The the rough concept is to strike the right balance between performance, cost, and size, to help bridge the gap until 10nm Xeon D CPUs arrive that will likely change everything, including NVDIMM support. Supermicro X11SDV-16C+-TLN2F is actively cooled, see giant CPU heat sink fan. Photo courtesy of Supermicro. 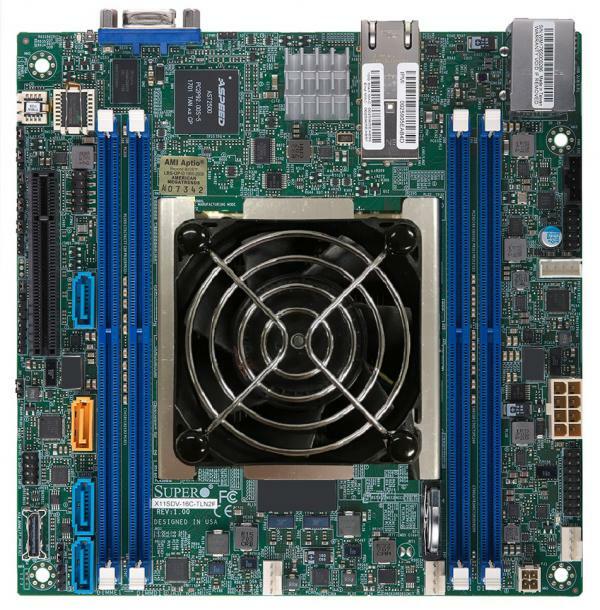 Supermicro X11SDV-12C-TP8F is passively cooled like all their Flex ATX motherboard designs. Notice the absence of a CPU heat sink fan. Photo courtesy of Supermicro. 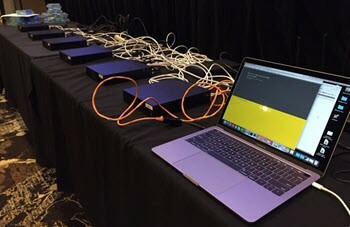 March 1st Connecticut VMUG UserCon - one lucky attendee will win a TinkerTry'd SuperServer, thanks to the VMware User Group! 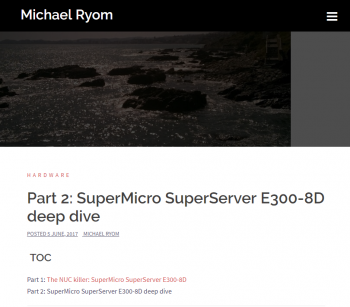 Supermicro SuperServer SYS-E300-8D and E200-8D powerhouses arrive, have a look under the hood! TinkerTry First Look - world's first Supermicro SuperServer SYS-E300-8D and SYS-E200-8D unboxing!